Calver has a finely honed talent for seeking out both the handsome and the functional. Her job involves responding to design briefs from licensees for the V&A’s product development programme in line with seasonal themes and exhibitions, scanning the museum’s collection of objects, artefacts, paintings, photographs, sculptures, textiles and prints (more than 2.3 million at the last count) to find items that might have a commercial life outside its galleries. When Samsung proposed a collaboration with the V&A for its new TV, The Frame, offering users access to the museum’s vast archive of images, Calver immediately put William Morris’ work front and centre of the project. ‘We included Morris’ wallpaper and textile designs because I think they suit different interiors - from simple, one-colour designs to ornately over-the-top sensational showstoppers. Samsung and Calver selected more than 20 V&A works for its Art Store, spanning centuries and cultures to tell the story of decorative art and design. From classic wallpaper patterns of the British Arts & Crafts movement to dramatic Japanese ukiyo-e woodblock prints, users will be able to enhance their surroundings with a digital display of V&A images that offer the perfect mix of art and history. Like Morris’ distinctive prints, Samsung’s The Frame is a thing of slender, artfully crafted, picture-perfect beauty. Designed specifically to give more purpose and meaning to the TV, The Frame’s 4K Ultra HD screen delivers a viewing experience that is sharper and four times more detailed than conventional Full HD. Moving and static images come alive, with both bright and dark scenes presented with incredible clarity. The Frame sits flush against the wall, just like a professionally hung artwork. A simple yet elegantly executed picture-frame moulding (in your choice of finish, including walnut, beige wood or white) raises the screen to art-gallery standard. Teaming state-of-the-art entertainment technology with the contents of a museum founded back in 1852 didn’t faze Samsung or Calver. ‘The V&A strives to keep pace with the digital world and aims to support new technologies through the collections,’ says Calver. ‘To this end, the V&A has been purchasing 3D printed material for the permanent collection, and archiving its collection in digital formats since 1997. ‘Ultimately, we know that technology can transform a visitor’s experience,’ says Calver. The 21st century notion of Samsung’s The Frame reimagining the home as an art space is perfectly in tune with the 19th century philosophy of the V&A’s first director, Sir Henry Cole. ‘Cole had the idea that museums should make their collections available to the public,’ says Calver. ‘As early as 1856, the museum provided black and white prints of objects and events for the public to buy, so even back then, you could bring a little bit of the V&A home with you.’ More than 150 years later, Samsung’s The Frame continues to honour this great tradition. This time, in beautifully rendered, perfectly framed, 4K Ultra HD. When Samsung’s The Frame goes in to ‘Art Mode’, it is not just a matter of the Ultra-High Definition (UHD) screen cleverly switching from one function to another. As the TV makes its seamless, automatic transition from moving image to perfectly rendered artwork, The Frame also makes subtle but significant changes to its surrounding environment. Users are encouraged to change the way they look at the screen, engendering a new appreciation of what they are seeing. 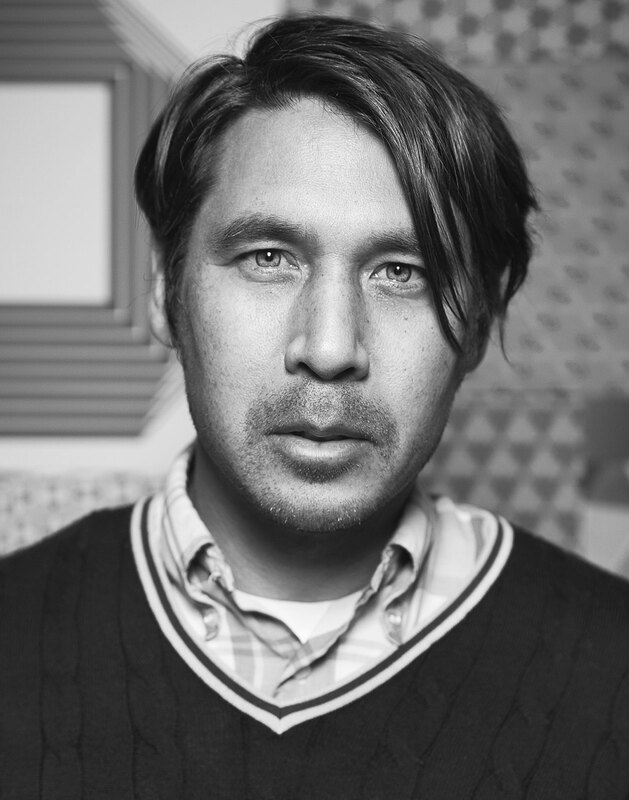 Van Middelem, a San Francisco-based site-specific artist and curator, worked closely with Samsung to find more than 100 pieces of art and photography across ten different genres to be scanned at 4,000k resolution and displayed on The Frame’s screen in UHD. Her mission was to connect with artists and users all over the world to collect exciting and inspiring images, working with the artists to scale the pictures for The Frame’s specific ratio while ‘also keeping the integrity and intelligence of those artworks alive’. Minimalist interiors photographer Luisa Lambri, architectural specialist Todd Eberle, the estate of Chinese legend Fan Ho, and Californian graffiti artist Barry McGee were all asked to contribute pieces. Says McGee, ‘My work is not inspired by consumerism but anti-consumerism, so the fit with a huge tech company was interesting, to say the least. But I think what Samsung has done is what all galleries and art institutions long to do – redefine how we receive the undefinable’. To satisfy her passion and appreciation of graphic work – patterns and op art, both folk and contemporary – Van Middelem also chose aboriginal artist Sarrita King and Tobias Rehberger, recipient of the Golden Lion award at the Venice Biennale back in 2009. With much of Rehberger’s distinctive work based on sharply delineated, graphic lines and bold, parallelised colour blocks, the German artist seemed a perfect match for The Frame’s 4,000k UHD and one billion colours capability. From the artist’s hand to your living room wall, Samsung’s The Frame is a contemporary art gallery... curated by you. Employing state-of-the-art technology, Samsung’s The Frame is a thing of slender, high-definition, picture-perfect beauty. With its 4K Ultra HD certified technology, the screen delivers a viewing experience that is sharper and four times more detailed than conventional Full HD. Moving and static images come alive on your wall, with both bright and dark scenes presented with incredible clarity. The Frame sits flush against the wall, just like a professionally hung artwork. A simple but handsomely executed picture-frame moulding (in your choice of finish, such as walnut, beige wood, or white) raises the screen’s glass to art-gallery standard. When The Frame is not in conventional operation – streaming films or catching up on broadcast news channels – it can be switched to Art Mode. 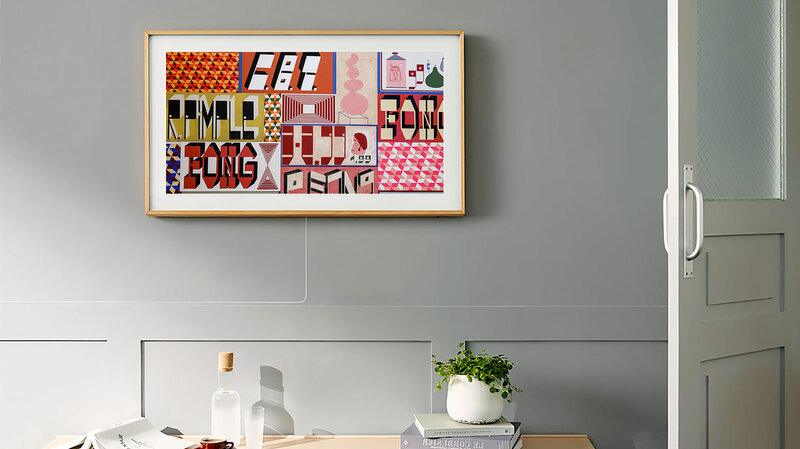 So instead of fading to a dull black like a regular TV, The Frame’s display transforms into a work of contemporary art, with users granted access to more than 100 custom-designed digital images in the Samsung Collection. Samsung is also partnering with galleries and museums all over the world to help users curate their own gallery of pictures with over 600 pieces of art available in the Art Store. The way we watch TV has changed, and television design is changing too. No longer the focal point of a room, but more a functional and decorative element of our interior design, a TV must look beautiful, work effortlessly and blend in with its surroundings, complementing a room’s aesthetics, materials and ambience. The concept of The Frame TV was born. Employing state-of-the-art technology, Samsung’s 4K UHD is a thing of slender, high definition, picture-perfect beauty. With The Frame’s 4K Ultra HD certified technology, the screen delivers a viewing experience that is sharper and four times more detailed than conventional Full HD. Moving and static images come alive on your wall with both bright and dark scenes presented with incredible clarity. Created in collaboration with Yves Béhar, The Frame sits flush against the wall, just like professionally hung artwork, or on its elegant easel-style ‘Studio’ tripod stand. Thanks to Samsung’s ingenious Invisible Connection system, there are no ugly wires or cables visible. A simple but handsomely executed picture-frame moulding (in your choice of finish, such as walnut, beige wood or white) raises the screen’s glass to art-gallery standard and when The Frame is not in conventional operation – streaming films or catching up on broadcast news channels – it can be switched to ‘Art Mode’. So, instead of fading to a dull black box, The Frame’s display transforms into a work of contemporary art, with users granted access to more than 100 custom-designed digital images. Samsung is also partnering with galleries, museums and artists to help users curate their own gallery of pictures. Mindful of avoiding needless energy consumption, The Frame’s motion and light sensors turn off the screen when there’s no activity in the room. The screen adjusts the brightness and colour settings of the display based on ambient light levels, which means that the art work displayed looks like real art and personal photos match their original colour and brightness settings. In the first of our short, Wallpaper* + Samsung film series, documenting The Frame’s design journey and interviewing some of the artists and curators collaborating on its artwork library, Kang talks about ‘a new screen experience’. ‘The Frame caters to a new type of lifestyle,’ he says. ‘For Samsung, it is not just about the technology. We focus on understanding future trends and lifestyles, designing in a new way. The whole design process is supported by Samsung separately from the technology. We approached it from the user’s perspective and provided a solution to the black screen. Our goal is to get involved in people’s lives in a meaningful way. 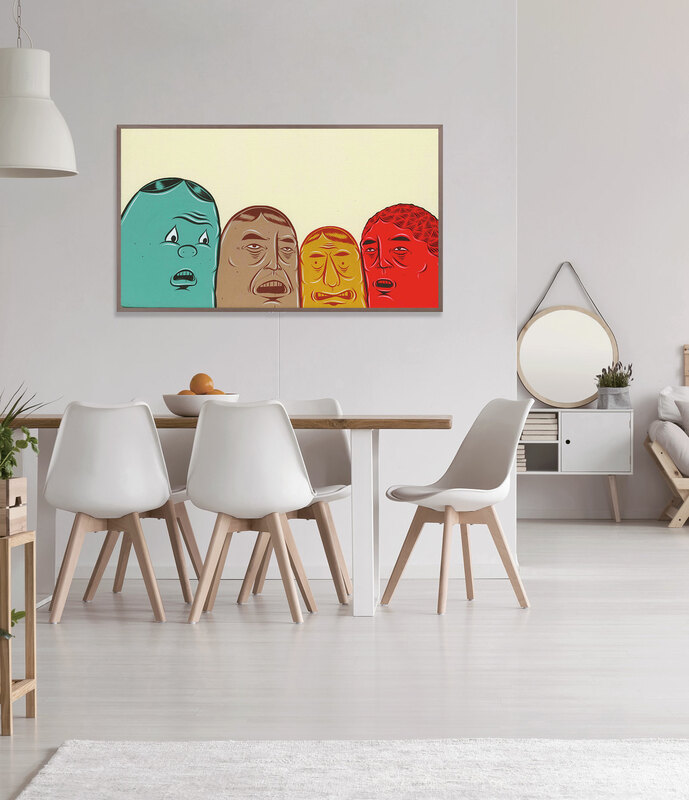 We wanted to make a product that was cooler than anything else out there.’ The Frame is television reborn, cool and minimal, exhibited as contemporary art in your personal gallery space.